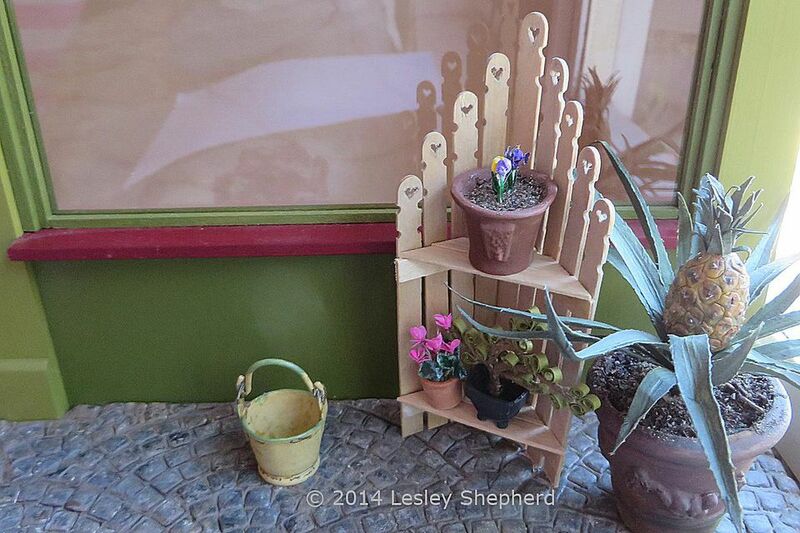 This shabby chic dollhouse corner shelf is made from coffee stir sticks filed to the shape of fence pickets. The technique works with craft wood as well as stir sticks, and the shelf can be made in a range of sizes to be free standing as shown, or sized to hang on a wall. The sides of the unit can have an angled or curved row of pickets. The picket sections can also be used to make fence corners for gardens, or screen dividers. You can make miniature fence pickets with all kinds of top designs. See the full sized fence pickets from the Australian fencing site,Old Malvern Pickets for ideas for picket designs. There are instructions for other matching pieces of furniture, also made from stir sticks or craft stripwood. I shaped my miniature fence pickets using miniature files on a stack of clamped stir sticks (see the technique for shaping miniature fence pickets). To make the heart openings in the centers of the pickets, I marked the spacing for two holes, drilled two holes which are slightly separated at the center using a mini drill (pin vice) and then used a scalpel (or craft knife) to cut the base of the heart and across the bottom of the lobes. A needle file or small roll of sandpaper can be used to clean up the design. For Halloween pickets you can try shaping miniature pumpkins, or gothic crosses in the top of the picket. If your craft wood or stir sticks have obvious grain lines, you may find it difficult to cut the openings without splitting the pickets. You can always paint a small design in the centers if you wish instead of cutting openings. Another alternative design is to shape half hearts with files on the outside edge of the picket. When two pickets are joined for the sides of the shelf unit, the heart opening will be visible in between pickets. Miniature Pickets To make the shelving unit as shown, I needed nine shaped pickets, plus a couple of extra pieces of stir stick for the shelf support and the two shelves. You may need a different number of pickets depending on the size of your wood and the size of shelving unit you wish to make. You can make your pickets from coffee stir sticks, frozen treat sticks, or craft stripwood. Mine is roughly 1/4 inch (6mm) wide. You can make shelves from the same strip wood, or use a piece of illustration board (bookboard) or craft wood. Clamps for clamping the shelf supports to the sides. You can use a grocery tin or some other heavy object if you don't have clamps. To make my shelf pickets step up to a central picket on the back of the corner unit, I folded a square of paper on the diagonal and and set the center back picket on the line of the fold. I then set four other pickets (for one side) so their tops touched the edge of the paper as shown. The pickets were spaced roughly the thickness of a single picket apart. If it is easier you can set the pickets so the sides touch. My stir sticks are slightly warped and curved, so I left a small space between them. With the pickets lined up on the paper, I marked the pickets across the base with a pencil line to set the base line for the shelving unit. You can cut it so the pickets are a particular height, or cut it as I did so most of the length of the stir stick was used. The longest picket will be the one in the center back of the shelf unit. Once you have the pickets laid out and marked for one side of the corner picket shelf unit, set each picket on top of an uncut picket and cut a matching set of pickets for the second side of the shelf. This will give you four sets of two pickets, each set a different length. You will also have a single picket, the tallest of the group, to fit on the center back of the unit. You can easily make the cuts for small sections of craft wood for these types of projects using a common set of garden pruning shears (secateurs) or the adapted Easy Cutter stripwood cutter which is a modified anvil pruner with a marked base for cutting angles. You can also use a standard miter box and razor saw combination to cut your pickets to length. When you have your pickets cut to length, stain or paint them and allow the pickets to dry. It is easier to finish the pickets before you stain them. To assemble the two sides of the corner shelving unit, lay out your four side pickets on a flat surface with the spacing you want between pickets. Measure across the set of pickets and cut two (or more) shelf support sections from wood which has been stained or treated to match your pickets. You need a minimum of two shelf supports to assemble each corner unit. You can add more shelves if you wish. Cut the same number of same sized supports for the second side of your shelving unit. Assemble the sides of the shelving unit by applying glue to your shelf support and laying one shelf support across the base of the pickets, just up from the bottom edge, and another across the upper section of the pickets just below the decorative shaping of the shortest picket. If you are adding extra shelves, glue them in place as well. Make sure your shelf supports are lined up at right angles with the long edge of the pickets so your shelves will be flat. Use clamps or weights to hold the shelf supports in place across the pickets until the glue has dried. Assemble first one side, allowing the glue to dry thoroughly, then lay the final supports across the final picket group, matching the supports to those on the finished side. You can lay the second set on top of the first, or beside the first to match the shelf supports and the bases of the pickets so they are the same on both sides. Glue the shelf supports to the second set of pickets, clamp and allow to dry. The tallest picket goes across the back corner of the miniature shelving unit. It is held in place by the shelves, either made of strips of wood, or a single piece of wood or heavy card / illustration board. Cut a small square of paper, the same width as your assembled shelf sides as a template. Fold the square along the diagonal, the diagonal will be the front of the shelf. Cut at least two shelves from craft wood or heavy card using your triangular template. Cut the top corner of your triangular template so it matches the width of your single back picket. Trim the interior corner of your shelf to match the template. You can glue strips of craft wood together along the edges if your craft wood is straight and true. Lay the craft wood strips out on a flat surface and cut them according to your paper template as outlined above. The individual strips can then be glued together to make a 'solid' shelf, which is then glued to the shelf supports (see next step). You can also measure a back strip for across the back corner of the shelf by marking a pieces of wood as shown in the photo on this page, so it is the width of your back picket. The ends to the width marking are then cut at a 45 degree angle as shown, so they will fit against the sides of the unt along the top of the shelf supports. Lay this back strip onto your template, and use the template to mark the edges of other shelf strips which can be spaced with slight gaps to accommodate wood which does not have straight edges that can be glued together. To fit the corner shelf unit together the sides are set at right angles with the back picket across the corner as shown. You may need to sand or file the bases of your sides if they do not stand square when placed on a flat surface. If you have cut a paper template, you can use it to line up the individual strips for your shelves and glue them across the shelf supports, beginning with the strip across the back corner. If using wood strips, glue the back picket to the first corner strip as shown before continuing the assembly. If you are using a solid self, the back picket can be glued across the back corner when the shelving is securely in place. If you have clamps, you can lay one side of the picket fence corner unit on a flat surface, then use clamps to hold the line of stripwood or solid shelf in place against one side of the unit. When the glue on one side is dry, reverse the unit so the glued side is up, and glue the second side of the shelf or shelf strips in place as shown. When the shelves are securely glued in place, touch up the finish of your picket fence shelving unit and fill it with your choice of miniatures. The picket fence corner shelf can be used for a miniature flower shop, or combined with the picket gate bed and the child sized chair to furnish a child's room or nursery scene.